(Sega All Stars) 2000-10-22 $19.95 ? NFL Blitz 2000 is an American football game for the Sega Dreamcast. It is the third game in Midway Games' NFL Blitz series, following the arcade games NFL Blitz (1997) and NFL Blitz 99 (1998). NFL Blitz 2000 follows a similar formula to Midway's arcade basketball series (popularised by NBA Jam, though NBA Showtime: NBA on NBC was the latest iteration at the time of NFL Blitz 2000's release), favouring fast-paced arcade style play as opposed to the more realistic simulations seen in the likes of NFL 2K or Madden 2000. The Dreamcast version of NFL Blitz 2000 was rushed to release and had several flaws upon launch (not least of which, the PAL version lacking a side label). In the US, it was re-released a couple of months down the line - these versions can be identified by the "HOT NEW" label on the packaging. 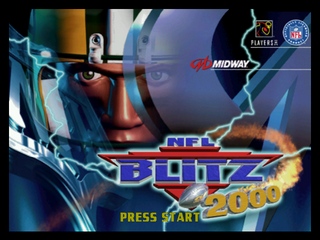 NFL Blitz 2000 was followed by NFL Blitz 2001. Main article: NFL Blitz 2000/Magazine articles.